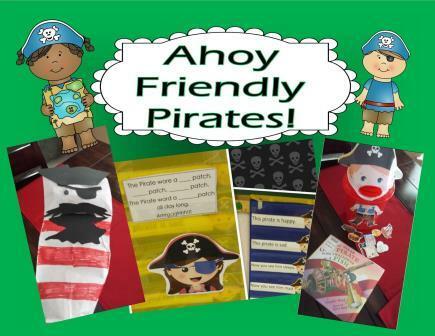 Pirate Themed Resources for Preschool and Kindergarten aged children. Page 4—Pirate hat template—Template for you to create a Pirate hat for the students in your class. Just print and trace. Pages 5 to 13—Pirate Poems with Manipulatives to Match. Color Poem and Emotions Poem. Page 15—Trace the letter P. Match the coins to the numbers. Draw the pirate faces. You can place this sheet in a page protector and use with a dry erase marker. Page 16—I punched holes in these and strung them in the center of a string. Use for beading activity. Page 17 to 22—Literature Extensions to Match There Was an Old Pirate who Swallowed a Fish. Includes story manipulatives and a little book to match. Page 23 to 25—A game to match the story. Page 27—A pirate themed puzzle you can program with a desired skill. Page 32—Template to create a pirate puppet. Page 43—What Treasure Box is the Pirate hiding behind. Page 46—Numbers 1 to six. Color, count, and glue activity sheet. Page 47—Graph the pirate pictures activity sheet.